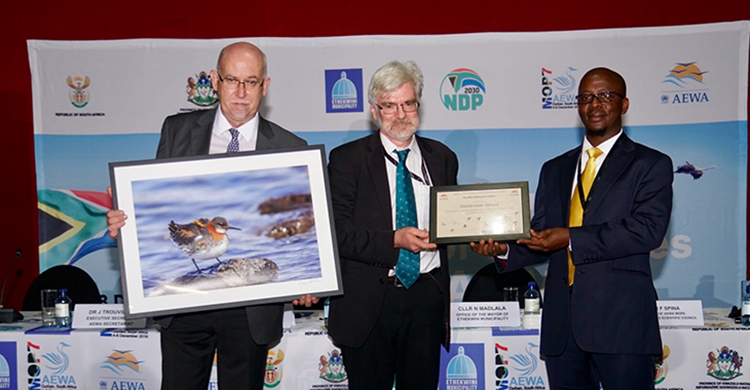 Durban, 4 December 2018 - Today, David Alan Stroud MBE, Senior Ornithologist at the Joint Nature Conservation Committee, was declared Honorary Patron of the Agreement on the Conservation of African-Eurasian Migratory Waterbirds (AEWA). David has been a member of the UK delegation to the Meetings of the Parties to AEWA since 1999. His scientific knowledge and advice underpinned UK input to the Agreement. For example, he edited species action plans and contributed to species listing proposals. The impact of offshore wind parks, poisoning by lead shot and wildlife disease are also part of his expertise. A species on which David has focused his scientific interest is the Greenland White-fronted Goose (Anser albifrons flavirostris) and he has studied the life cycle of this species. He is famous for numerous publications on wetland and waterbird conservation and these publications have contributed to raising public awareness on a wide range of conservation issues. Many national and international bodies involved in wetland and waterbird conservation have benefited from his expertise. As a government adviser in the UK, he reported on the development of the EU Birds Directive and its implementation. Being involved in both EU actions and international agreements he worked hard to create interlinkages across the range of waterbird conservation policies.